What is Diabetic Nephropathy? Diabetic nephropathy also know called as diabetic kidney disease is a chronic progressive kidney disease characterized by diffuse scarring of the glomeruli and nephrotic syndrome secondary to longstanding uncontrolled diabetes accounting 30-40% of all end stage renal disease cases in the United States and one of the top reason for dialysis in developed countries. It is classified as small blood vessel complication of diabetes characterized by progressive decline in glomerular filtration rate (GFR), persistent albuminuria that is confirmed on at least two occasions 3-6 months apart and elevated arterial blood pressure. Albuminuria is described as the presence of albumin in urine >300mg/d or >200ug/min. The management of diabetic nephropathy is one of the key role in the treatment for diabetic kidney disease. Aside from taking medicine, a major change in lifestyle is a must, early notice in signs and symptoms of diabetics nephropathy and knowing the stages of diabetic kidney diseases can boost the chances to survive in this kind of disease. Generally, there are no symptoms in the early course of diabetic nephropathy. As the disease progresses, the kidneys are more unable to do their job. These late diabetic kidney disease symptoms include kidney pain, nausea, vomiting, itchy skin, no appetite, general feeling of illness, and swollen legs and feet. 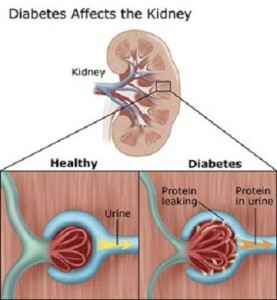 Diabetes can cause a number of changes to the body’s blood circulation and metabolism leading to the production of excess reactive oxygen species damaging the kidney’s glomerular filtration barrier (GFR) resulting to albuminuria, which is the hallmark of the disease. Glomerular filtration barrier (GFR) is the one responsible for the highly selective filtration of blood entering kidney’s glomeruli. Under normal circumstances, only small molecules, water and very small proteins are allowed to pass this barrier. Albumin does not pass through intact glomerular filtration barrier. Hence, the presence of albumin in urine signals damage of this barrier. Table 1. Urinary Albumin Excretion. Overt diabetic nephropathy means dipstick-positive proteinuria and decreasing glomerular filtration rate [GFR]. There are 5 stages of diabetic nephropathy that can be easily known by anyone, just check the table 2 chart and compare it with the laboratory result. Table 2. Chronic Kidney Disease Stage. In the end stage of diabetic kidney problems, patient normally will have a diabetic kidney failure result. The only option to survive using medical treatment in a kidney failure is dialysis or transplant. Aside from those with uncontrolled diabetes, evidence shows that hypertension associated with obesity and metabolic syndrome contribute in the pathogenesis of diabetic nephropathy. Central obesity, metabolic syndrome, and diabetes also lead to increased blood pressure. Increased systolic blood pressure further exacerbates the disease progression to proteinuria and reduced glomerular filtration rate, leading to end-stage kidney disease. Glycemic control, limit salt and protein intake, as well as medicines that lower blood pressure and protect the kidneys are key goals on the effective treatment of diabetic nephropathy. These medicines should be started as soon as any amount of protein is present in the urine. If you are hypertensive, two or more medicines may be needed to control your blood pressure enough to protect the kidneys. Medicines are added one at a time as needed. One must be reminded to avoid medicines that damage or stress the kidneys. An example of this would be nonsteroidal anti-inflammatory drugs (NSAIDs) which include ibuprofen and naproxen. 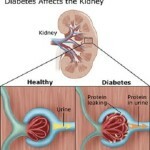 Diet also plays an essential role in the treatment of diabetic nephropathy. Maintaining blood sugar levels within accepted range prevents further damage to the blood vessels in the kidneys. In keeping with current recommendations for the general population, all diabetic patients should consider reducing salt intake at least to less than 5-6 g/d. Limiting salt intake helps keep your blood pressure from getting high and may help slow progression of diabetic kidney disease. In advanced cases, protein and phosphorus restriction may help you preserve kidney function. A study done last 2012 showed that low-sodium diet group (24-h urinary sodium/creatinine ratio (mmol/g) < 121) as compared with higher sodium intake group had better renoprotective and cardioprotective effect of angiotensin receptor blockers (losartan or irbesartan) in type 2 diabetic patients with nephropathy. Medicines used for initial treatment of diabetic nephropathy include angiotension-converting enzyme inhibitors (ACEI), such as captopril, ramipril and enalapril; and angiotension II receptor blockers (ARBS), such as candesartan, losartan and telmisartan. These medicines can lower the amount of protein being excreted in the urine. As diabetic nephropathy progresses, blood pressure usually rises making it necessary to add more anti hypertensive drugs. See High Blood Pressure. Below are some recommended books or pdf sold by amazon. 1st of all 5.3 is consider to be high. Be sure to talk with your physician about it, but if you don’t want to have a dialysis you might as well try traditional Chinese medicine. Aside from talking to your physician, be sure to controlled your blood sugar and high blood pressure. Most important is change of lifestyle, almost 90% of all sickness came from bad hobbit in lifestyle. Live simple and think positive.